The Grumman F6F Hellcat was a carrier-based fighter aircraft developed to replace the earlier F4F Wildcat in United States Navy (USN) service. Although the F6F resembled the Wildcat, it was a completely new design powered by a 2,000 hp Pratt & Whitney R-2800. Some tagged it as the "Wildcat's big brother". The Hellcat and the Vought F4U Corsair were the primary USN fighters during the second half of World War II. The Hellcat was the first USN fighter designed in view of lessons from combat with the Japanese Zero. (Many now consider this statement to be urban legend for it is true that the plane didn't first fly until June of 1942, but most feel that the design had been frozen prior to any US experience fighting the A6M. Ed) The Hellcat was credited with destroying 5,271 aircraft while in service with the U.S. Navy and U.S. Marine Corps (5,163 in the Pacific and eight more during the invasion of Southern France, plus 52 with the Royal Navy's Fleet Air Arm during World War II)., which was more than any other U.S. naval aircraft. Postwar, the Hellcat was phased out of front line service, but remained in service as late as 1954 as a night fighter. The F6F-5N was a night fighter version, fitted with an AN/ APS-6 radar. Some were armed with two 20 millimeter (0.79 in) AN/M2 cannon in the inner wing bays and four 0.50 in (12.7 mm) M2 Browning machine guns in the outer bays. It isn't often that we get a new tool aircraft kit from the CyberHobby gang, but when they do one, it is done quite well. So it is with this new Hellcat kit. Most of you realize that the Hellcat is a favorite with many companies in 1/72 and we have had them from Airfix, Frog, Heller, Hasegawa and Academy to name a few. The latter two were the best of the bunch, but I think even they have been eclipsed by this new version. First of all, the parts are superbly molded with outstanding engraved detail. One gets a fully detailed cockpit that rivals many larger scale kits and includes sidewall pieces. It is here that the only etched bits in the kit are used; the pilot harness. The kit provides a full engine with mounts and an accessory section. The major advantage of this kit to others is that it can be built with the wings folded. No need to go aftermarket with this one. 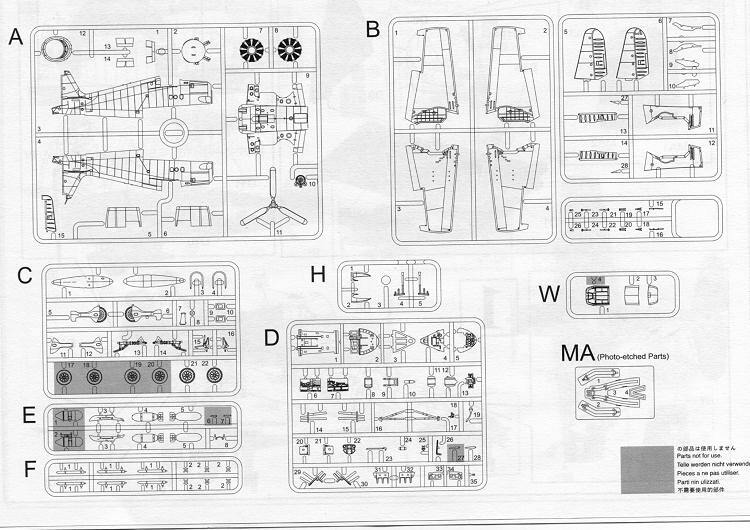 It also includes a bevy of under wing ordnance options. However, being a night fighter, I'm not really sure any of them would be appropriate aside from the centerline fuel tank. But in case you want to do a standard F6F-5, you do have bombs and rockets, for which you'll have to open the appropriate holes in the lower wing sections. At least for the rockets as the bomb pylon holes are already drilled so you may want to fill those. The kit includes separate ailerons which is a good thing as these were generally offset when the wings were folded and the flight control rods were disconnected. You also get three different tread tires. While the diamond tread are shown, you can probably use the others without fear of the detail police. The kit has nicely done landing gear and provides the proper inner longer gun barrel as used by these aircraft for the 20mm. The guns are a separate insert for those wanting to do a straight F6F-5. Even the radar pod for the F6F-3E is shown, but of course, you won't be needing it (do I sense another boxing?) . Those concerned about the shape of the forward cowling can rest comfortably as it looks right. You are provided with two canopies. A single piece one and one with a separate windscreen and sliding portion. There are three markings options, all in overall sea blue. I like sea blue as you basically paint everything this color, including wheel wells and gear legs. The three markings options are all from 1944/45 and for VF(N)-90 on Enterprise, VF(N)-41 on Independence and VF(N)-76 on Hornet. Decals are well printed and should work well. Not sure if any aftermarket are currently available in terms of markings, but I do know that Microscale did a sheet of USMC planes many, many years ago. 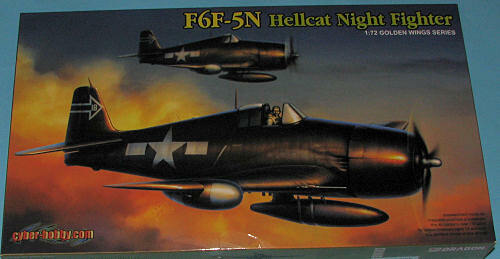 If you want the latest and greatest in 1/72 Hellcats, you now have it. Build the others, but save your real efforts for this one as there is a new Sheriff in town! My thanks to www.dragonmodelsusa.com for the preview kit. Get yours at your local retailer.